come out right, it’s time to move on to a new recipe. 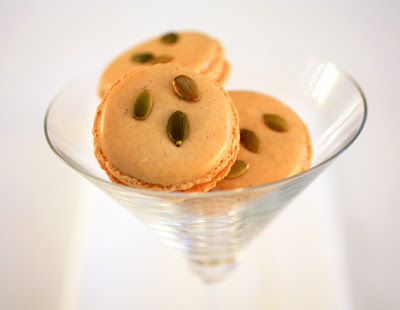 favorite filling for macarons) flavored with chestnut puree. You can make your own or buy it canned from a gourmet shop. If you’re brave, you can serve these with the coffee after Thanksgiving dinner, but my guess is they won’t be appreciated then. 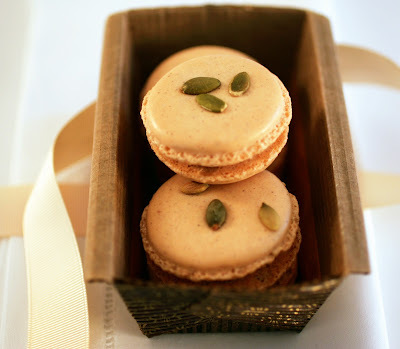 Better to give each guest two or three macarons (wrapped in a cello-bag tied with a ribbon) to take home to enjoy the next day, when eating is once again possible. *Note: If you have time, it’s best to ‘age’ your egg whites before using them. Separate the whites, then store them in the refrigerator in a covered container for 48 hours. Bring them to room temperature before using. 1. Line a baking sheet with a silicone mat or parchment paper. 2. In a food processor, process the almonds with the confectioners’ sugar, cinnamon and ginger until well blended. Sift the mixture through a medium-mesh sieve into a bowl. 3. In the bowl of an electric mixer, using the whisk attachment, beat the egg whites on high speed until foamy. Very gradually add the granulated sugar and beat until stiff and glossy. Add the vanilla and beat until blended. 5. Position a rack in the center of the oven and preheat the oven to 375° F. Fit a pastry bag with a .4-inch plain tip (Ateco #4). Scrape the batter into the bag. Pipe out 1-inch rounds of batter onto the prepared baking sheet, spacing them ½ inch apart. Rap the baking sheet firmly against the counter. Dry the batter at room temperature, uncovered, for 12 minutes. 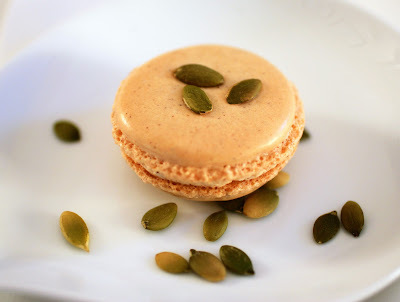 Place three pumpkin seeds on top of each macaron. Dry the batter for another 12 minutes. 6. Stack the baking sheet with the macarons on it on another baking sheet. Place both sheets, stacked, in the oven and bake the macarons for 13-16 minutes, until slightly crisp (they will crisp more upon cooling). Cool completely on a wire rack. 7. In the bowl of an electric mixer, mix the chestnut puree at low speed with the paddle attachment as you gradually add the confectioners’ sugar and rum. Mix until relatively smooth and set aside. In a small, heavy saucepan, combine the granulated sugar and water and cook over medium heat, stirring constantly and occasionally brushing down the sides of the pan with a wet pastry brush, until the sugar dissolves. Remove the pot from the heat while you start beating the eggs. 8. In the bowl of a heavy-duty electric mixer, using the whisk attachment, beat the eggs at medium speed until the sugar syrup is ready. 9. Place the sugar syrup over medium-high heat and cook, without stirring, until it reaches 238°F on a candy thermometer. Remove the pan from the heat and with the mixer off, immediately pour about 1/4 cup of the hot syrup over the beaten eggs. Beat at high speed until blended, about 10 seconds. Turn the mixer off and add another 1/4 cup syrup. Beat at high speed for another 10 seconds. Repeat this process until all of the syrup is used. Using a rubber spatula, scrape down the side of the bowl and continue to beat at medium-high speed until the egg mixture is completely cool, about 5 minutes. 11. 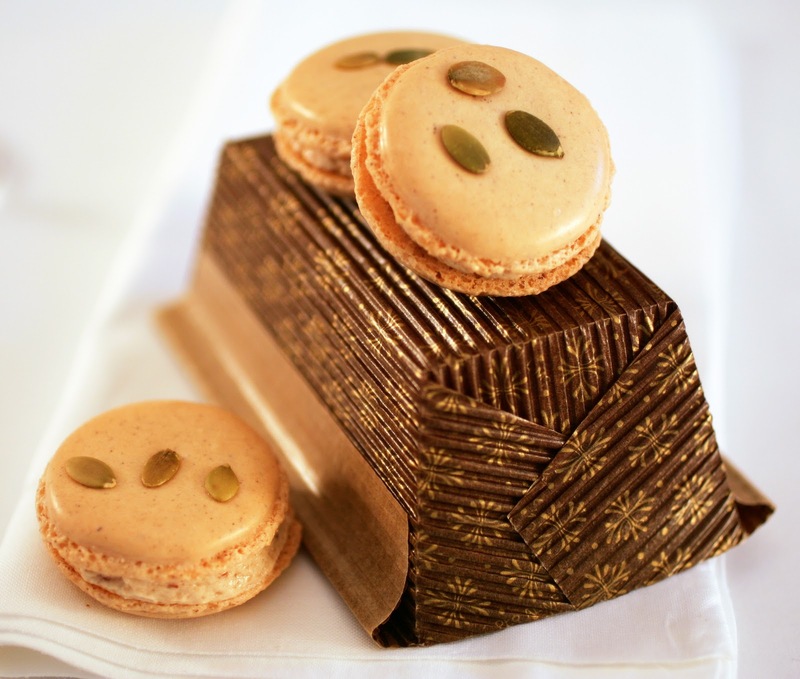 Scrape the buttercream into a pastry bag fitted with a .4 inch plain tip (about the same size as you used to pipe the macarons). Pipe a grape-sized dollop of buttercream onto the underside of a macaron. 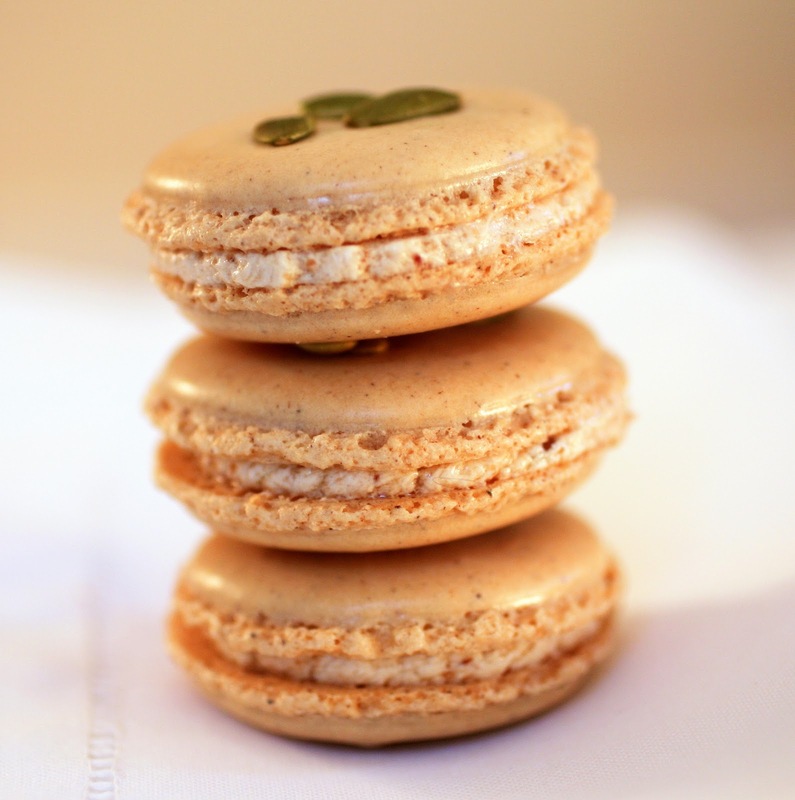 Gently press the underside of another macaron against the buttercream until it spreads almost to the edge. Repeat with the remaining macarons and buttercream. Store the macarons in an airtight container at room temperature for up to 5 days. They can also be refrigerated for up to a week.